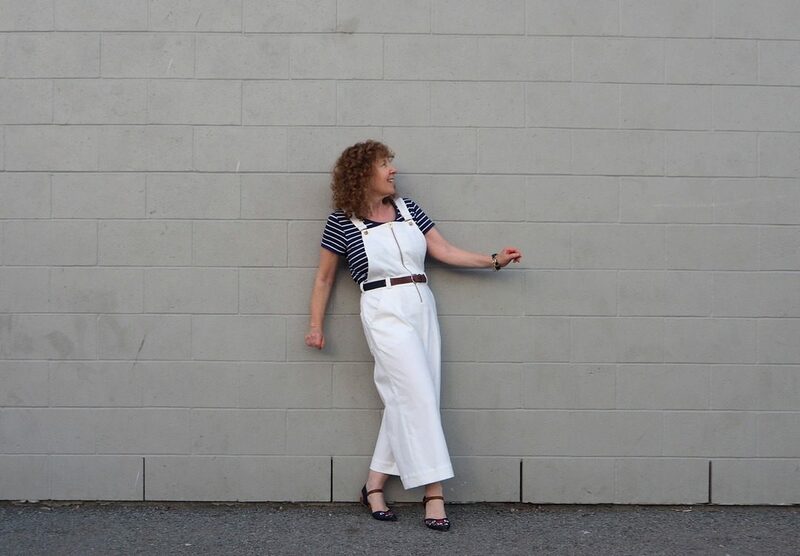 Back…as promised…and modelling my Jenny Overalls from Closet Case Patterns. I patterned tested for Heather a few months ago, sewing two muslins in the process. 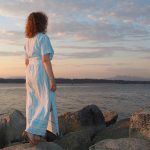 Unlike other testing I’ve done, I used inexpensive muslin fabric for my makes…because, well…that never ending debate about whether one should or should not wear overalls after the age of…I dunno….six? To be clear, I wanted to make the overalls. But…insert pensive expression here…I was just really unsure if I was going to be able to pull off the look. I’ve long said that I dress to suit my personality and…after some contemplation…I committed myself to making the overalls version. Okay…full disclosure…it wasn’t just contemplation. 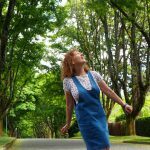 I emailed style mavens Heather (Closet Case Patterns) Suzanne (Suzanne Carillo) and Melanie (Bag and a Beret) and asked their opinions. They were all eleventy hundred percent in favor…they collectively empowered me to give my version a go. I’m so happy I went for it. They feel really me…they’re fun but they don’t feel too juvenile. I made two design tweaks to the original pattern. First…for practicality…belt loops. I’ve been sewing a lot of fitted pants over the past year and, much to my frustration, my waist measurement has been like a yo-yo. Up. Down. I wanted to be sure my Jenny’s would be wearable every day so I made them the tiniest bit too big at the waistline and added the belt loops. Now…if my tummy goes a little up or down…I can still wear my pants! Second, I switched the side lapped zipper to an exposed front zipper. I think the end result of this design feature is a slightly more grown up look. I used a few brain cells figuring it out and I made copious notes and I plan to make a second pair. Would you be interested in a blog post with photos and details? My overalls have gold accents: the exposed zipper and buckles. I also made a simple self-fabric tie belt. 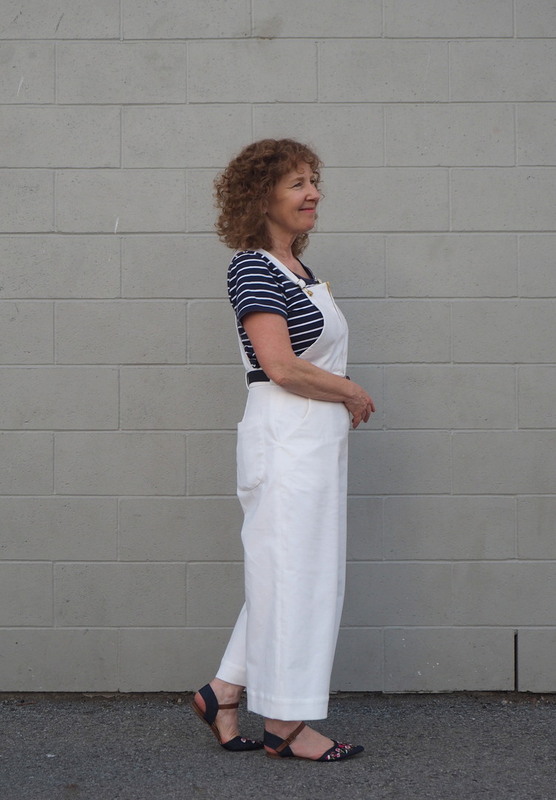 Both the Jenny Overalls and the Jenny Trousers are drafted to have a high waist and ease through the hips. The legs are wide. I’ve made the cropped version, but there is also a full length option as well as a shorts option. 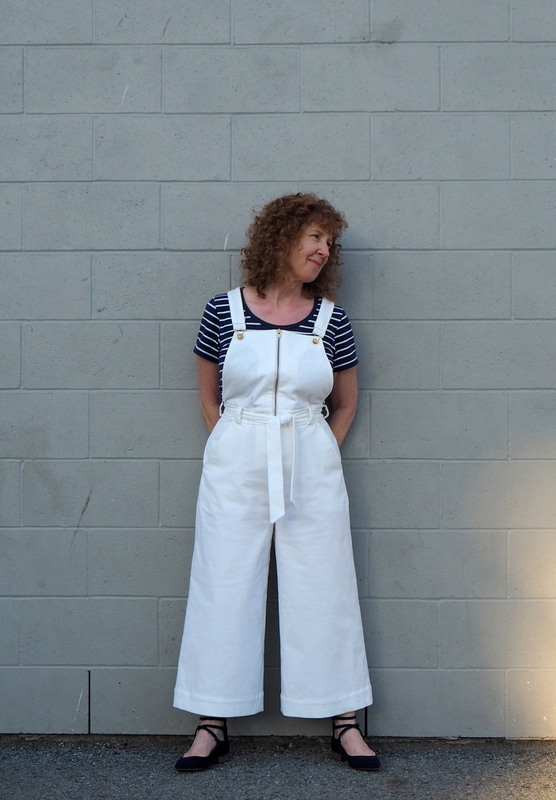 The Jenny Overalls have roomy front slant pockets and extra roomy back patch pockets. Ermmm….let it be said that those back pockets do a stellar job of containing the straps while in the ladies room. The fabric is soft fine wale corduroy from Dressew Supply. 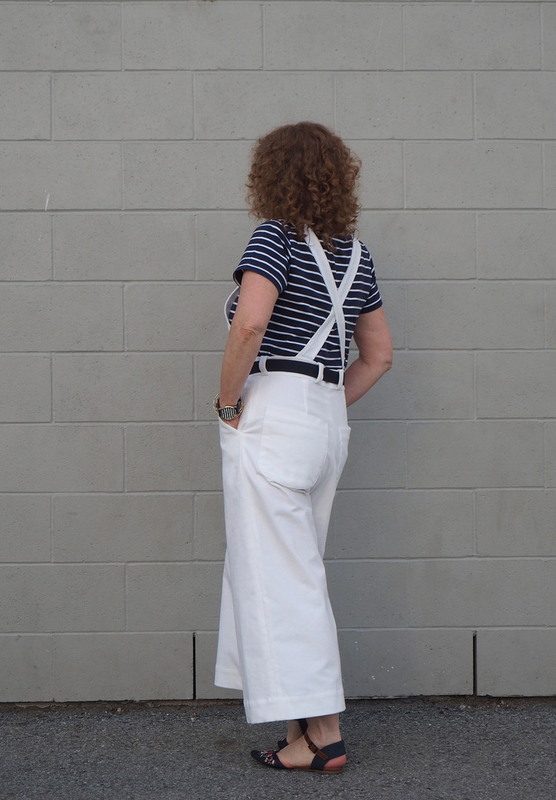 Wearing overalls is not for every one….I get it. 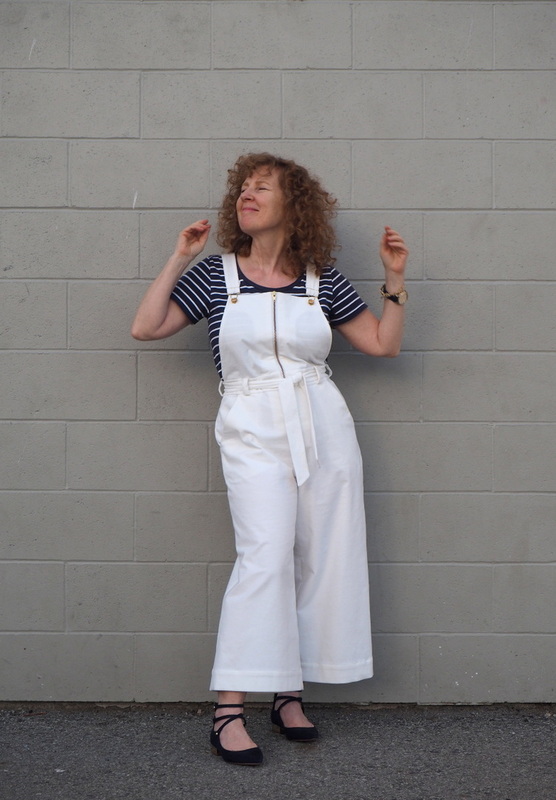 Hey…Heather gets it too…the Jenny Overalls pattern includes a trousers version. That being said, I can’t tell you how much I love mine. I’m curious…would you wear overalls? Aw…thanks so much Margo. I know your life is busy these days…I love that you were able to stop by and say hello! I came here to say the same thing! being ‘well endowed’ I don’t feel like I need anything extra over my chest region, but I am eyeing the burnside bibs in a drapery fabric – I just made the lower neckline version of the York, and I am happy with that, so I think they will be ok!! Hey Linda! I hear ya. And…it was a concern of mine. I thought it might….hmmmm…magnify the assets? But, I think the coverage is such that it looks really good. I too have the Burnside Bibs. Are you planning them in a drapery fabric or a drapier fabric, just to clarify? 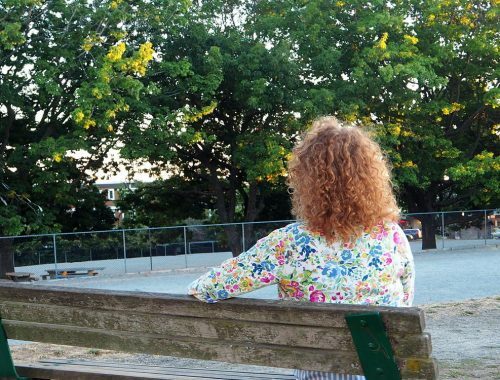 I’m curious because I often use drapery fabrics for garments! But, in this case, I am planning on making the Burnside Bibs in a drape-y fabric like a linen weight. Now. The York. When I reviewed my York Pinafore photos, I thought there was too my attention to my chest area. That being said, I think it is mostly an issue of the close fitting t-shirt. I may add a bit more width to my next York though….ah….getting it just right with a changing body ain’t always easy. Thanks Janet. Heather really wanted us, as in pattern testers, to make the bib version primarily so she could see how it sits over various bust sizes. I have a large bust and I think the coverage is really good. Fantastic job! Your version is perfect for the “grown up” girl. I love this!!! LOVE it! Grown up girl suits me perfectly, thanks Jackie! LOL…you’ve painted such a detailed mental picture Kathleen. I get it! You don’t look close to 63 by the way…and with long gams, I’d think about rockin’ the trousers version of Heather’s pattern. Hmmmm….that makes me sound like an enabler, LOL. You rock those overalls, woman! Love them on you. Definitely not for my potato shape however. Speaking of your frustration with an expanding and contracting waist, I haven’t seen *my* waist in decades! LOL!! Woo Hoo! Thanks Louisa! I have to say I won’t surprised if my waist takes a walk on the wild side and never returns either. I hear ya on the waist fluctuations. My waist can change 2 inches in a 24 hrs period. I’m 65, and newly retired, 6 months now. Left a very active job, an immediately gained weight, 25 lbs in the first 4 months. Love to be following a blogger in my age range. Love the overalls, you look great in them. Thanks for blogging. Thank YOU Marilyn. So happy you stopped by and said hello. You’ve brought up a good point. I never considered my day job to be an active job, but now that I think of it, I was walking, reaching, lifting for much of the day. 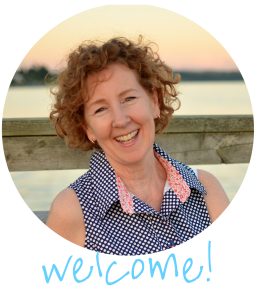 Sewing at home….not so much. I must make time for more movement in my days! Love it. These are great for you. I like the styling in the top photo best. Love those simple shoes with it with the fun ankle straps. And I love the same fabric belt with it (one visual long line??). This is a perfect garment for you. And you know I don’t lie. Confusion. I meant the second and third photo. With the black shoes. Thanks Greetje! I love these ankle strap shoes, but find them a bit tricky to style. I too think they work well with my overalls. Very lovely! And they look absolutely great on you. I’ve never been an overalls person but I’ve been seeing them a lot lately in the sewing community so I’m tempted to go ahead and try making a pair. Thank you so much! 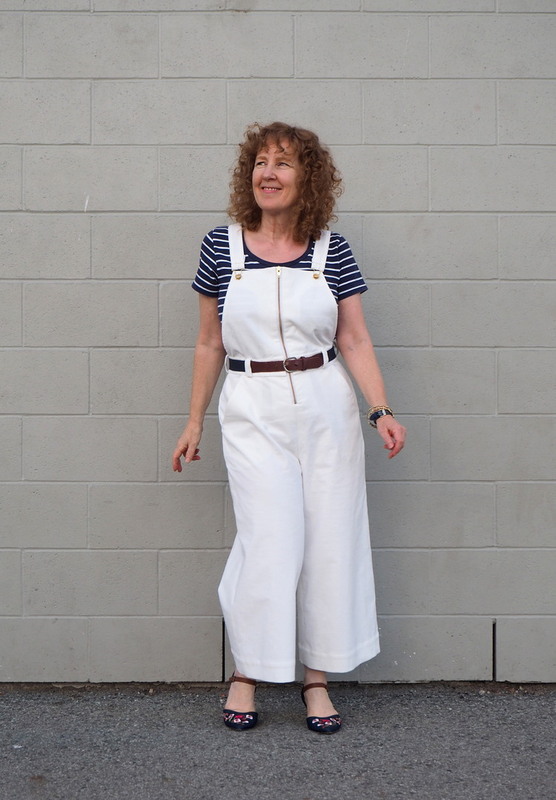 I haven’t worn overalls since the seventies. YIKES! And, to be honest, really didn’t think I’d jump on the overalls train this time around. (I’ve had the Burnside Bibs pattern for almost a year and still haven’t had the courage to sew them.) Being a pattern tester pushed me to try something new and I’m really happy I did! Normally I wouldn’t be attracted to overalls but these are super cute. I think that people don’t realize you have a large bust and the pants don’t emphasize it at all. WHOOP! Thanks bunches Suzanne! Yes, I agree…maybe some people don’t know that I have a large bust. Heather has drafted this pattern to sit very nicely across the chest. Thanks Treasa! I am on the hunt for some suitable fabric to make another pair. And then, yes…I plan to photograph and document my process! Love your overalls. LOVE them! They look just great on you. They don’t suit my present lifestyle so I wouldn’t wear them but if my situation changed, I’d definitely consider them. I really like the zipper down the front. And love your black shoes with all the straps. Brand? Aw…thanks Barbara! It’s surprising to me…but I do feel that this silhouette suits me. 🙂 My shoes are Aldo, one of the few brands I can mostly count on to fit. These look fantastic Sue! Very you! Thanks so much Heather. 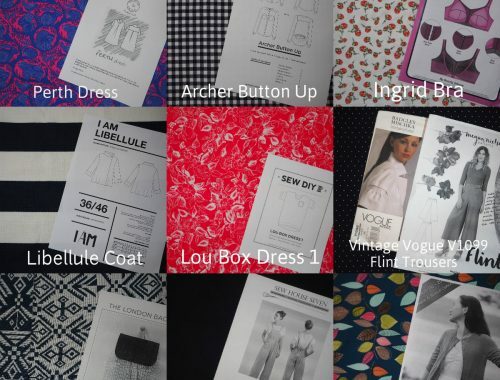 Did you pattern test this time round? These look so lovely on you! I really love them. I looked for like the overalls pattern but I couldn’t find it. Thank you for sharing the great review. Thanks bunches! 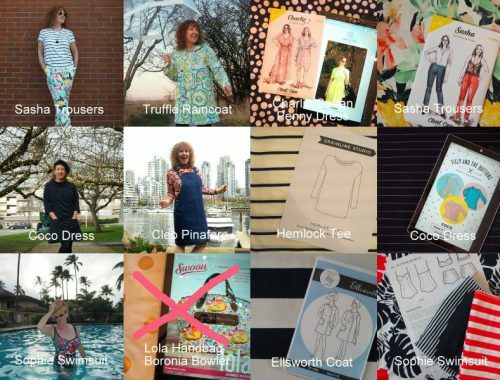 If I understand you correctly, you are looking for the Jenny Overalls pattern? You should be able to click on the link at the bottom of the post to go to Closet Case Patterns. Thanks Gillian! Your comment has me in the clouds! A marvellous look, Sue. 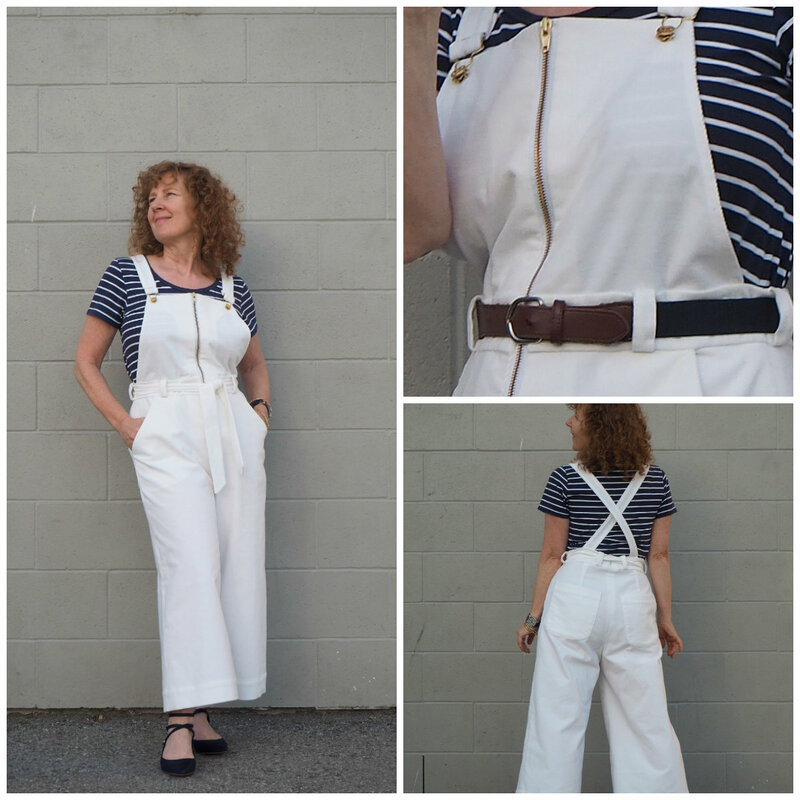 I love the feminin shape of the overall. Thank you Sabine. I’m never sure how Heather does it, but she does indeed manage to give these overalls a feminine vibe! These are both cheerful and chic, which means they match your personality perfectly! I love the wide legs, and I like that the front bib has been designed to be flattering to women with larger breasts. I would definitely wear these too, although not in white because I am a spill magnet. Thanks Shelley. Previously I would have thought that a bib, was a bib, was a bib. But…Heather has managed to create a bib that covers and even flatters a full bust. YAY!